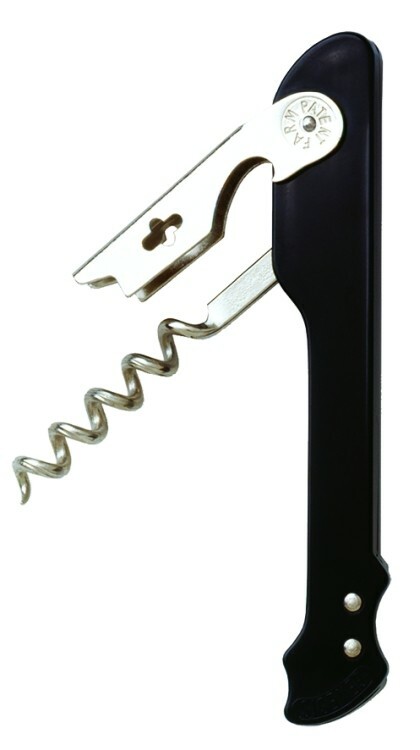 Strong, 2-piece, ABS plastic corkscrew. The protective sheath that covers the spiral comes off to form a firm crossbar handle. 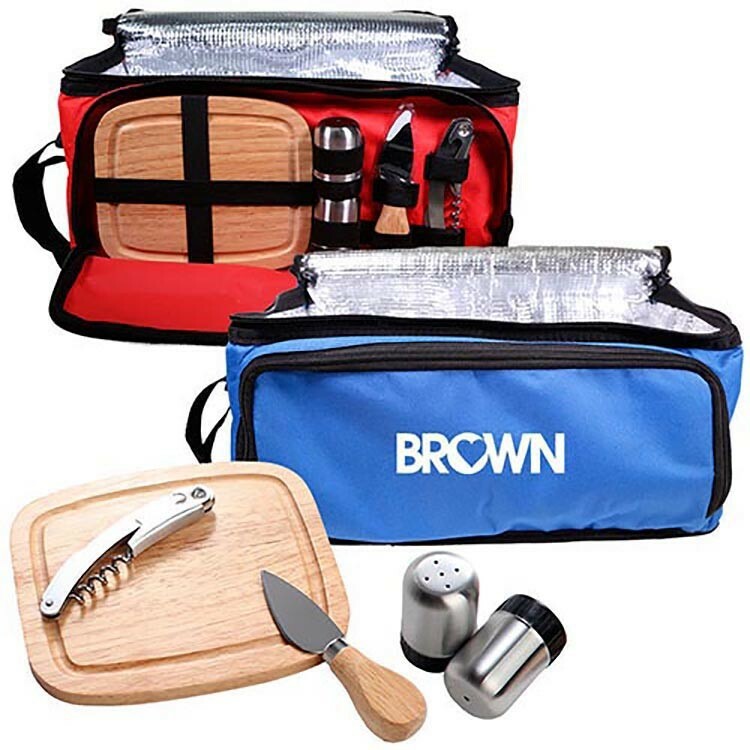 Great for hotel room service, room amenity, promotional gift, picnic and gift baskets, and more. The Capitano® is unique because of its special elongated spiral. 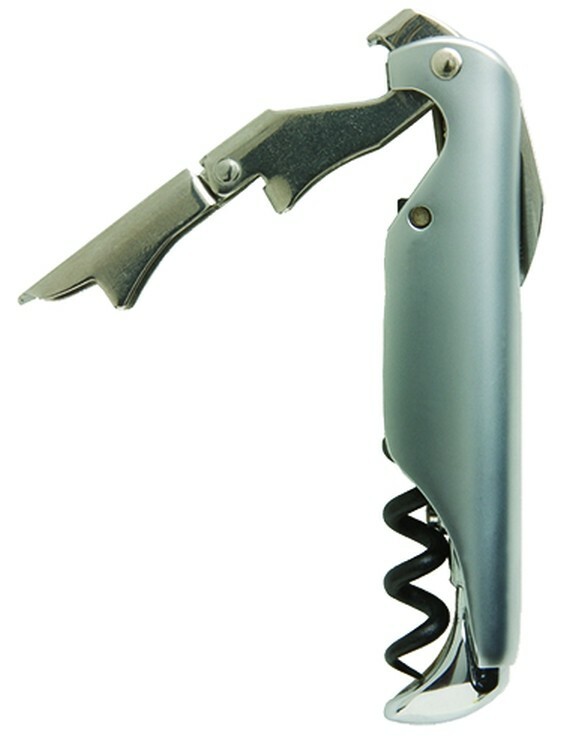 The pitch (distance between the twists) has been increased for easy, more positive insertion into the cork. The nickel plated spirals always have the filet, or etched line, running down the spiral. This traditional spiral cuts into the cork more quickly. The non-stick coated spiral comes in a smooth, non filet version. Crafted in France by the World's best spiral makers. Unique hinged double-lever system. Serrated knife blade. Contoured steel handle. Non-stick spiral. 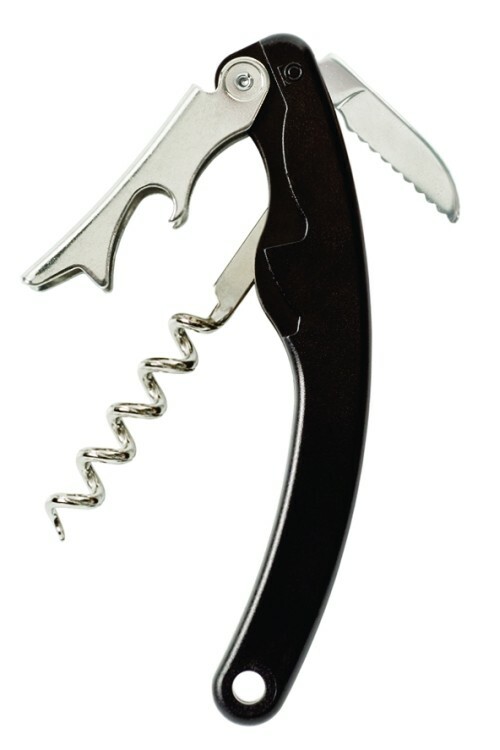 Strong, two piece ABS plastic corkscrew, foil cutter and bottle opener. The protective sheath comes off to form a firm crossbar handle. 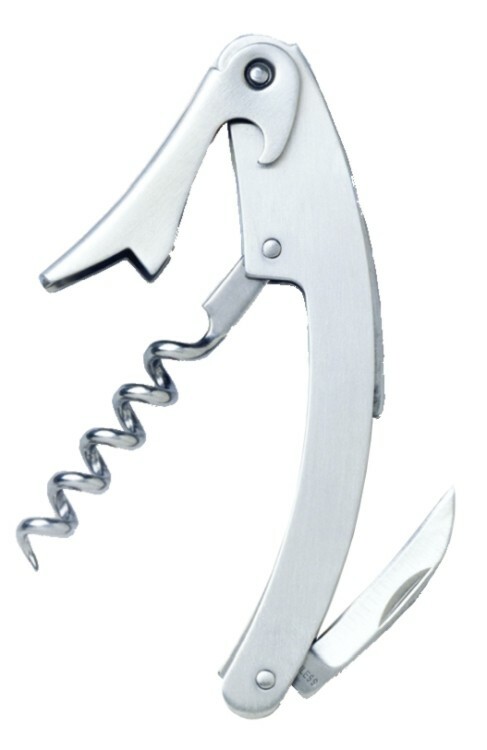 Top constraint is also a metal bottle opener. Great for hotel room service, room amenity, picnic basket, trade shows or direct retail. Add $.40(A) for Gold or Black Nickel Plating. Any Custom Shape. Preserve left over wine with completely custom wine bottle corks. Up to 4 colors included in pricing. Choice of gold, nickel, silver, copper, brass - antique or shiny. Perfect for Corporate Gifts or Weddings. Consists of one traveler's corkscrew and one flex seal bottle stopper. Mix and match colors of your choice. Look at black inset in handle. "Patent Pending" indicates this worm applies. The SWIFTPULL® Replacement Worm is a component of the SWIFTPULL® Uncorking System. This attractive set is neatly packaged in a hinged black wood box with clasp. The inside contains flocked fabric material around each item. All silver plated items with one each: Heart-Shaped Foil Cutter, Magnetic Wine Collar, Two-Piece, Bottle Pourer, Smooth-Pull Corkscrew and Conical Bottle Stopper Round Knob Top. 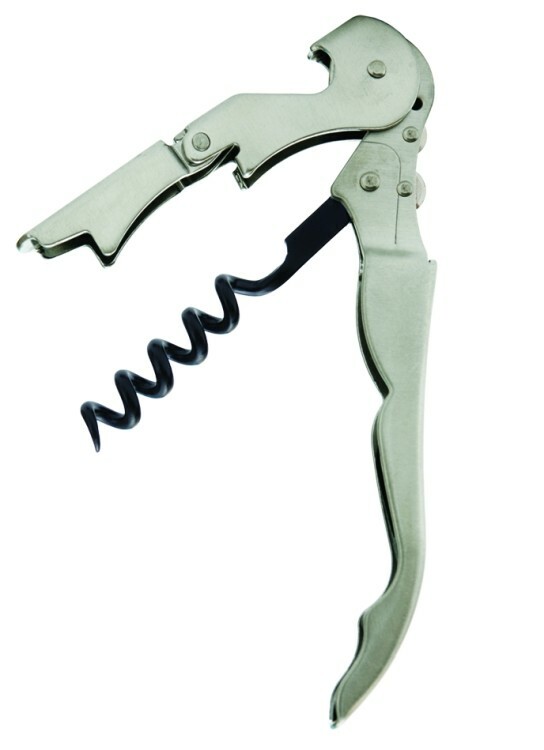 Each corkscrew is equipped with a five-turn, elongated conical spiral, micro-serrated knife blade with fingernail grip and cap lifter. There are two adjustable axis connections, one at the spiral connection and the other at the boot lever connection. A special two-sided wrench (included) allows you to loosen or tighten the tension needed to open and close the spiral or lever. Customize these tensions by screwing or unscrewing the connection with the proper fitting of the wrench. Replacement Worm for SWIFTPULL® Pro. 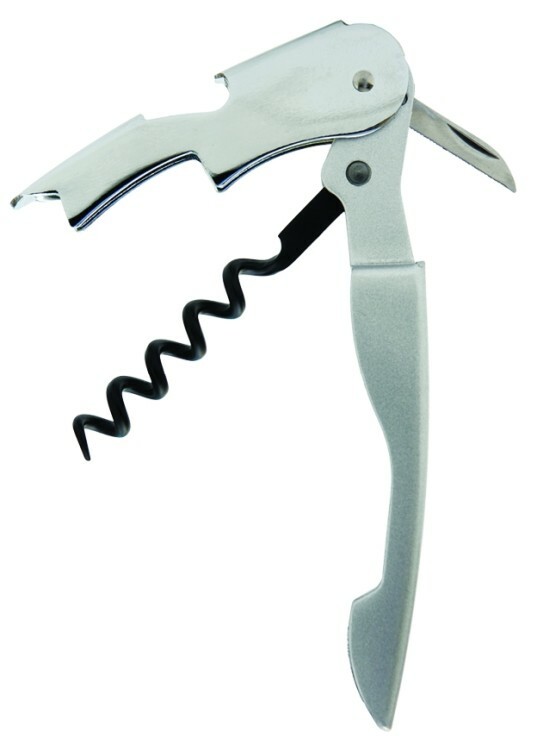 The new Pulltap's® corkscrew with a sliding blade is designed to be used with one hand. 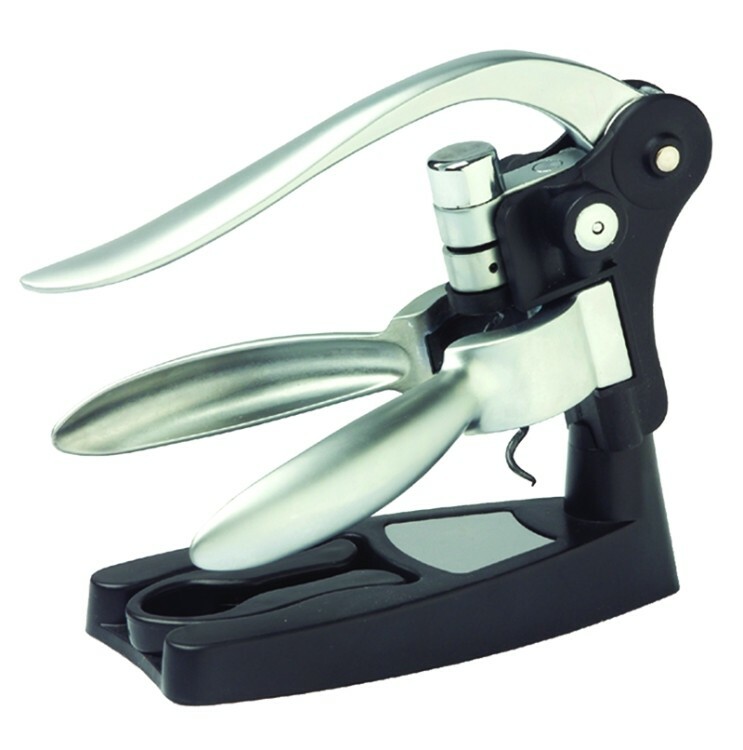 This high quality corkscrew is hand made in Thiers, France, and designed by an award-winning sommelier. Especially designed for heavy use. French oak barrel handle. Comes with black leather belt holster. Same unique hinged double lever that has made Pulltap's® famous. With an extendable handle for compact pocket storage (3 3/4" closed; 4 5/8" open). Non-stick spiral. All-in-one two step boot lever. First step in boot lever extracts cork about 3/4". Second step extracts the rest of the way out. Strong enameled steel handle. Stainless knife blade. Non-stick coating on spiral. A keepsake. 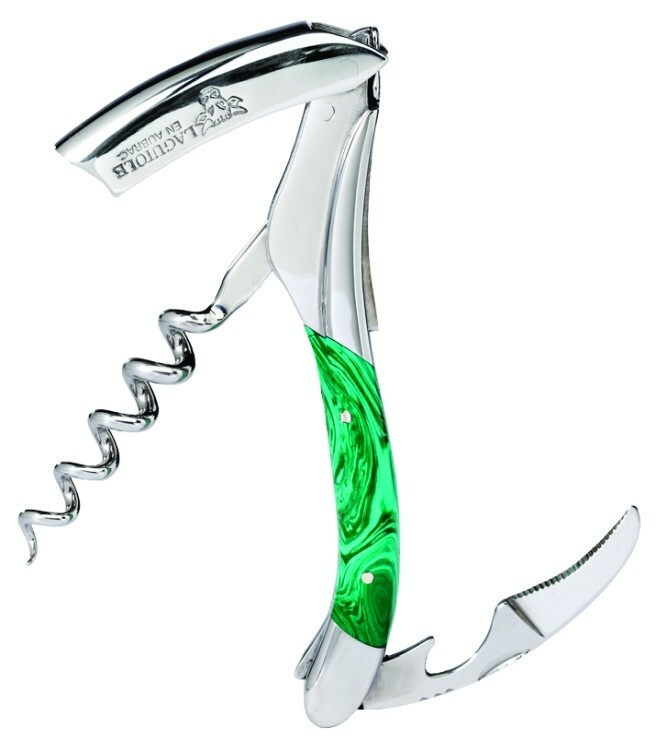 The most prestigious corkscrew in the world, this exquisite professional corkscrew line continues to grow in popularity. 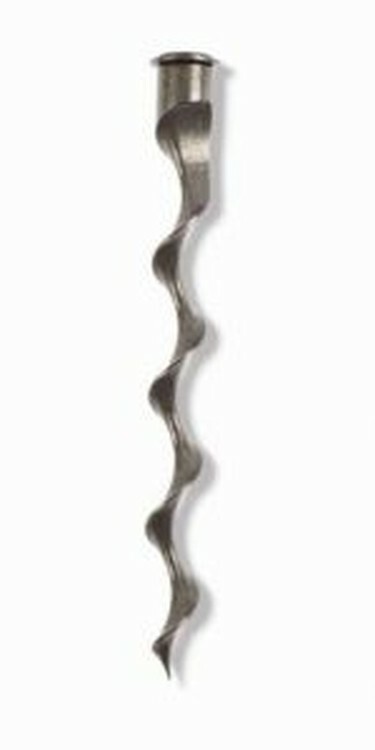 Each corkscrew is elegantly designed to include: a long forged knife blade, a smooth rounded boot lever and a long spiral. Each comes boxed in it's own custom leather pouch. 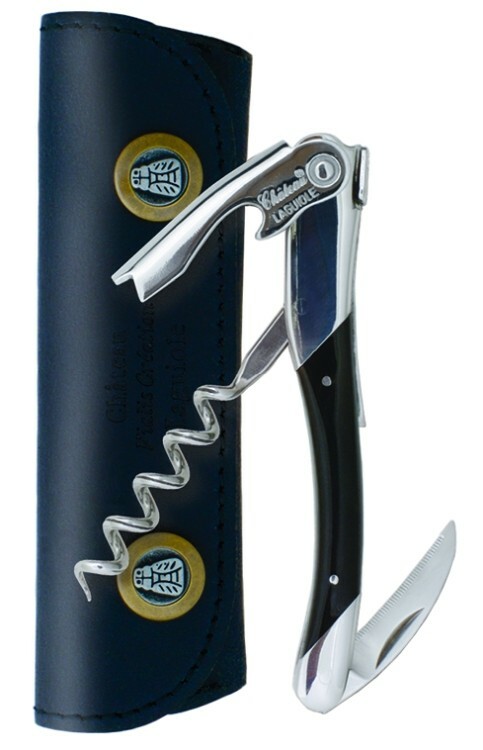 Each Chateau Laguiole® waiter's corkscrew is meticulously handcrafted to perfection in Thiers, France. 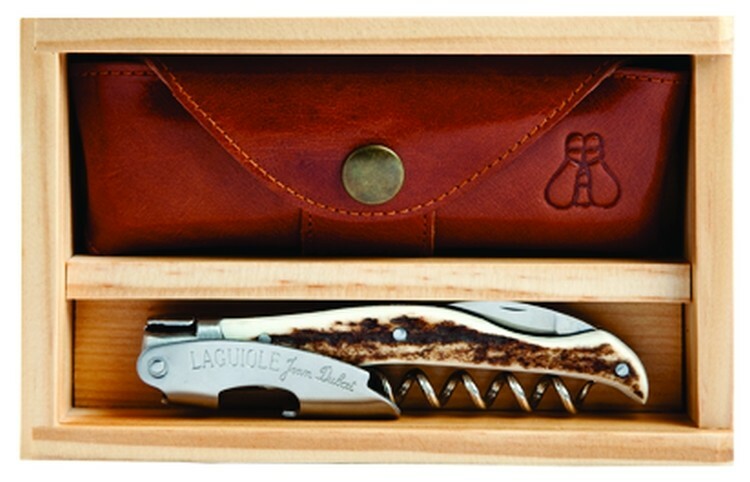 All Laguiole™ En Aubrac Waiter's Corkscrews come in wood boxes with black finish. Malachite is a green banded stone. Hand finished reproduction of an early 19th Century English corkscrew featuring a rack and pinion. Antiqued brass. Comes with natural wood hinged box. 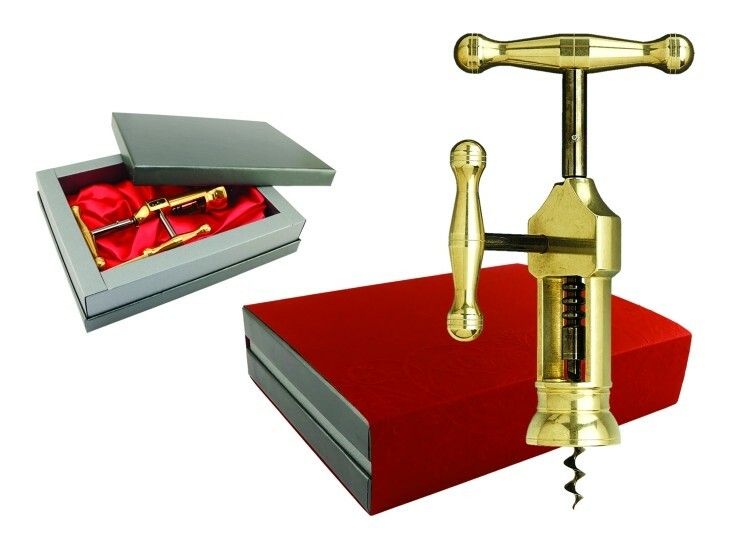 The most prestigious corkscrew in the world, this exquisite professional corkscrew line continues to grow in popularity. 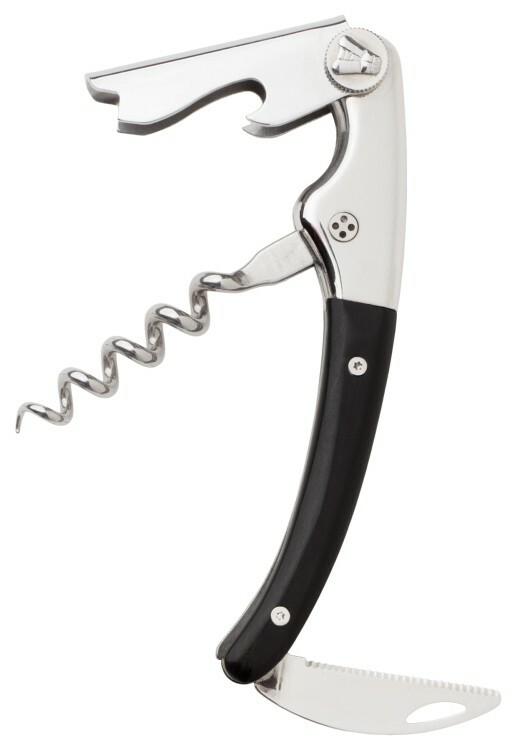 Each corkscrew is elegantly designed to include: a long forged knife blade, a smooth rounded boot lever and a long spiral. Each comes boxed in it's own custom leather pouch. The elegant Grand Cru design features longer stainless steel bolsters (bolsters are the stainless steel plates on the sides). Handcrafted to perfection in Thiers, France. Floating axis design. 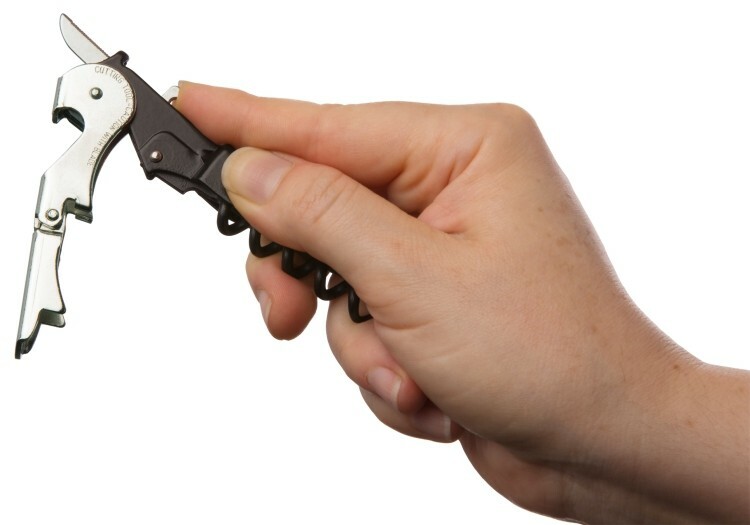 Includes a tempered two-wheel foil capsule cutter, instead of a knife blade. Nickel plated knife. Quarter inch hole at the end of the handle allows for attachment of a chain. 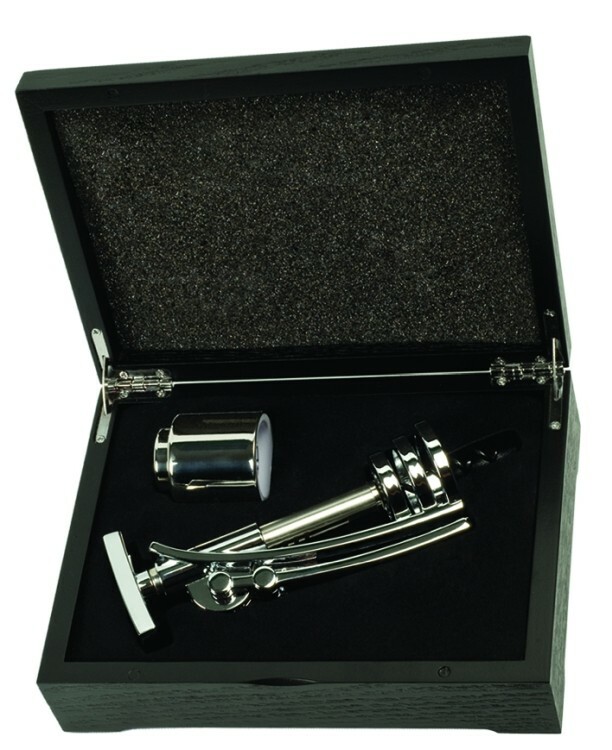 Contains hand held de-corker, foil cutter, stand and a spare spiral. Die cast handles. 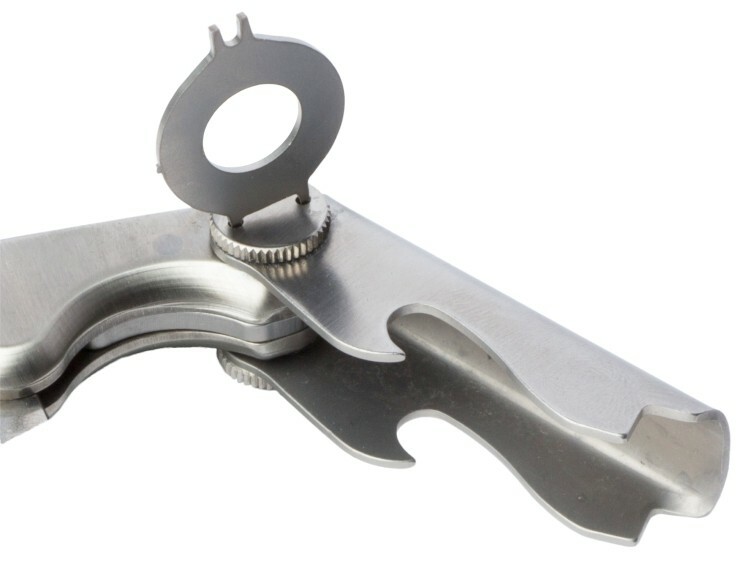 Stainless steel boot lever. All stainless steel body. Non-stick coated spiral. Unique capsule cutter. 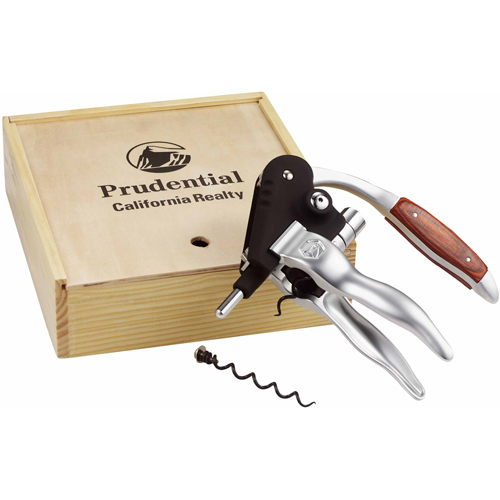 Set contains a corkscrew (Single-handle, zinc alloy, chrome plated ratchet corkscrew. Hold lever handle in down position tight to the body while turning top handle until spiral has fully penetrated the cork. Pump handle up and down several times until the cork is ratcheted from the bottle.) 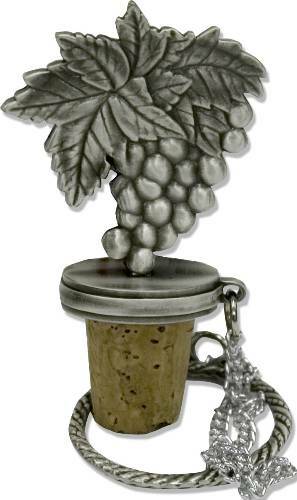 plus a stainless steel wine stopper. The stopper pushes onto the bottle. Press on the spring-loaded top to release from the bottle.